Research scientists at UCLA have won a major battle in the ongoing war against tooth decay. How have they done so? With a new type of mouthwash that supposedly targets and eliminates the specific group of bacteria responsible for tooth decay. The enemy in the fight against cavities is a very specific bacterial organism, called S. Mutans. This nasty bacterium is responsible for causing cavities, by producing enamel-eating acids as a by-product of feeding off sugars in the food we eat. In a study involving twelve patients, it was found that this new mouthwash eliminated all trace of S. Mutans after just one rinse! However, this is not what differentiates this new mouthwash. What makes it unique is that it’s “smart” meaning it actually targets S. Mutans. This is different than traditional substances used for their antibacterial properties, which kill all bacterial life with equal effectiveness. This leads to the question: why only kill a select group of bacteria in the mouth? Aren’t all bacteria bad bacteria? 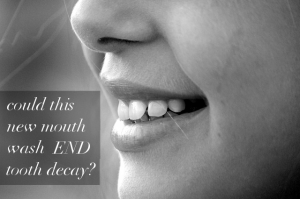 The answer is no, not all bacteria in your mouth are bad guys. In fact, most are there serving a probiotic purpose, like aiding in digestion of food. So, a product that can leave the healthy bacteria, while killing all the S. Mutans drastically reduce cavities in the population.